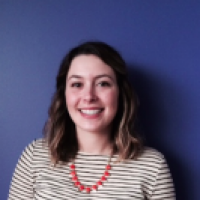 Marketing professionals constantly develop content meant to engage and inspire consumers. Successful online campaigns must meet a specific, and often elusive, combination of factors to go viral. But, some companies have hit the jackpot and earned widespread attention from online consumers through meme marketing—think Most Interesting Man In The World, Grumpy Cat (has her own Lifetime special!) and Left Shark. 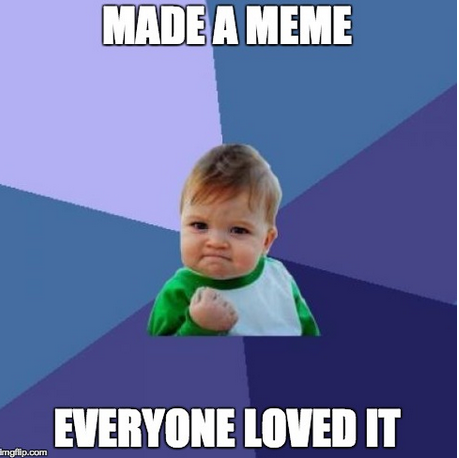 Memes can be used by marketers to better engage customers and connect with a broader group of people. While most marketers could swiftly identify, if not generate their own memes today, a quick history lesson may shed additional light on how and why these viral images got to where they are today. In 1976, evolutionary biologist and writer Richard Dawkins stated that a meme is essentially the imitation or transfer of a packaged cultural concept among a large group of people. Things like fashion styles, architectural trends, or catch-phrases (‘Duh!’ anyone?) passed from person to person are considered memes. Memes aren’t bound by state lines or cultural differences, though they may adapt over time to better suit certain types of users or local environments. Today, memes are familiar images, videos, phrases, characters, and concepts—or a combination of these—that provide entertaining messages to people all over the world. Typically, a meme is a simple image with a phrase posted over it in block lettering. Take Success Kid for example, this meme features a toddler striking a victory pose with his tiny fist and a look of determination. His face is the backdrop for countless memes about finding success in even the most mundane situations. Photo memes: Pictures of different people imitating a trendy or recognizable position or action, often with an equally familiar phrase. In the example below, you can see the meme of planking—where participants plank on random objects, or in unusual places. Video memes: Taking popular footage and changing the context, or putting a twist on a familiar concept. Popular mini-animations or video clips like the gif are shared widely. In the example below, a gif from the show 30 Rock can be shared as a response to someone, or the user can overlay text to communicate a message in addition to the visual. Image memes: Also known as macros, these memes feature recognizable images with unique captions. 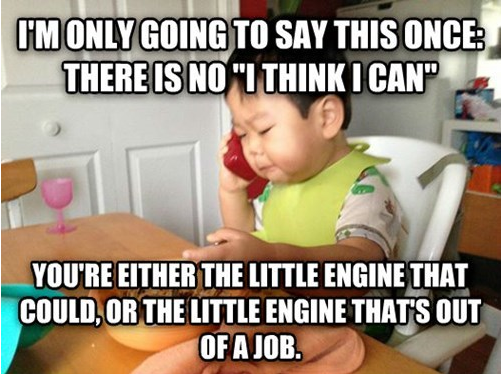 In the meme below, you can see the popular meme, business baby with some funny text over it. Other popular image memes include grumpy cat, philosoraptor, and The Most Interesting Man. Word memes: Hashtags can technically be considered viral word memes. They allow anyone and everyone to add a punchline, category, or topic to a written post online. Often people will catch on to the virality of a hashtag and create new content. 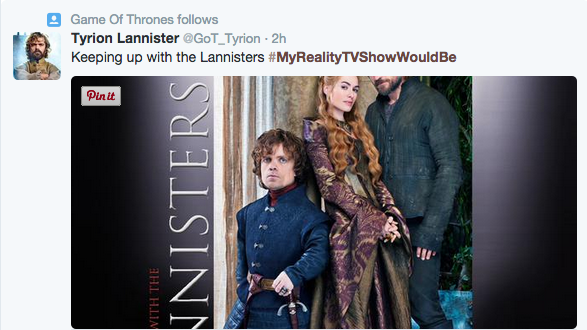 In the example below, the twitter account for the fictional Game of Thrones character, Tyrion Lannister, jumped into the trending hashtag #MyRealityTVShowWouldBe. With memes populating every corner of the internet—sites like Twitter and Tumblr are excellent sources for popular memes, as they facilitate sharing and are designed to promote trending topics, hashtags, and images. Other social platforms like Pinterest, Facebook, and Instagram are also relevant, as they provide users with the opportunity to share and like pictures. While most viral memes depend upon an already established character, phrase, or concept, some businesses are creating original memes as a way to spark conversation among consumers. Ikea Singapore, for example, developed its own meme with a unique character and silly captions that have both quickly become recognizable, viral marketing sensations. 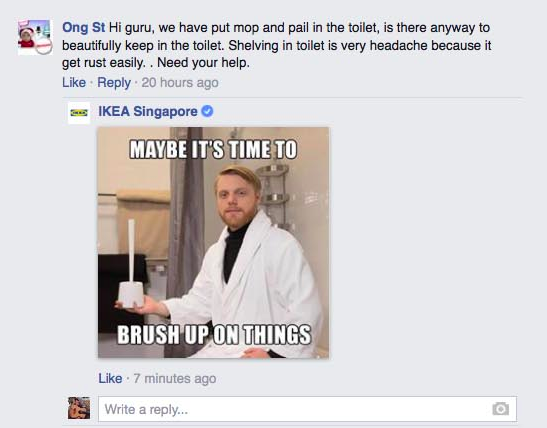 The Shelf Help Guru, a personal assistant-type figure, offers advice to individuals through memes on Ikea Singapore’s Facebook page. When consumers post home improvement or design-related questions on the page, the Shelf Help Guru responds to each one separately with a meme featuring an image of himself and a bold pun relating in some way to Ikea furniture. The image links back to the product page on the Ikea website. An example of these one-on-one exchanges begins with a consumer asking, “I have a small bedroom and not enough storage space for my stuff. Any solutions?” The response from Ikea Singapore is an image of the Shelf Help Guru, decked in all black, sitting on an Ikea bed with his foot propped on an open drawer affixed to the underside of the bedframe. Bold, white text at the top and bottom of the image states, “Some things are best kept inside”. The meme response was posted roughly 15 hours after the question was asked. As AdWeek pointed out, the responses are clever puns, teetering on the funny side, though they are not actually helpful to finding a solution. In fact, many of the customer inquiries themselves are jokes, with each consumer trying to find a way to be part of the action without anticipating real design guidance. So, why and how are these memes successfully marketing Ikea and its products? Perhaps the biggest key to meme marketing is comedy. The most engaging and sharable memes are funny. As WebSearchSocial points out, when marketers use humor in their advertising, it forces consumers to let down their guard. Any distrust or apprehension toward a business dissipates, or is at the very least weakened for a few moments. Humor is humanizing—allowing marketers to connect with people on a real, emotional level, which other methods don’t offer. In addition, people process images faster than they do words. Memes are incredibly easy to digest, as they combine several familiar concepts into one cohesive unit. Memes also put consumers at ease because they are inclusive. It’s as though businesses are sharing an inside joke with individual customers, who then decide to share their experiences with friends and connections on social media. Everyone wants to be part of the fun. Memes go viral because consumers can’t wait to show their friends the next clever combination of familiarity and absurdity. Marketers shouldn’t shy away from experimenting with memes as marketing tools. They can be hugely beneficial to growing a consumer base and engaging clientele in a fun, entertaining way. Have you used memes in your marketing? What was the result? Share your story in the comments below.